Razer's getting ready to release a couple of redesigned Kraken headsets, the Kracken Pro V2 and Kraken 7.1 V2, both of which wield 50mm custom-tuned drivers. As you might have guessed, the latter also features a virtual 7.1 surround sound engine, though that's not the only difference between the two. The Kraken 7.1 V2 uses a USB connection, has a microphone with active noise cancellation, and offers Chroma lighting, whereas the Kraken Pro V2 uses a 3.5mm audio jack, passive noise cancellation, and no lighting. The two 50mm drivers in both headsets are bigger than the previous generation Kraken headset and, according to Razer, deliver a wider frequency range for superior audio. Razer went with a unibody aluminum frame this time around. 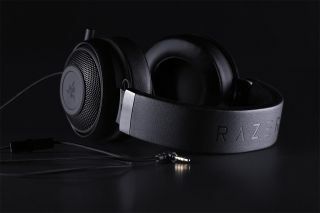 That makes the headsets more durable and flexible than competing headsets, Razer says, noting that the Krakens have been extensively tested to withstand drops, bending out of shape, added weight, rough handling, and more. "The result is a headset that is truly ready for all the rigors of pro-gaming," Razer says. If that's the case, we assume they can withstand temper tantrums, too—the kind that might compel a gamer to fling his or her headset across the room in a fit of rage. Not that we've ever done that, of course. Razer also enlarged the ear cushions for comfort and to help isolate sound better than before, and made them softer, too. They're circular, though if you prefer an oval-shaped earcup, you can swap them out (oval ear cushions sold separately). You can pre-order the Kraken Pro V2 today for $80 (€90) and it will ship next month. The Kraken 7.1 V2 runs $100 (€110) and also ships next month, though Razer isn't accepting pre-orders at this time.